Your participation matters consider getting involved…. We would love to have you as a part of our volunteer teams! 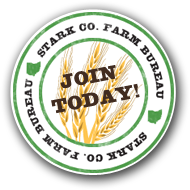 Your membership in the Stark County Farm Bureau opens the door to participation in a true grassroots organization where your participation and input matter. The success of the Ohio Farm Bureau is due in large part to the success county Farm Bureaus achieve in their local communities. County Farm Bureau Action Teams are groups of Farm Bureau members who come together each year to set the agenda regarding the issues, events and projects their respective Farm Bureau deems important and worthy of attention. Counties operate with four action teams: Organization, Communications, Public Policy and Food and Animal Issues. An action leader leads each team, with help from three to five participants who have special interest in team activities or special skills to offer. It is up to each county’s board of trustees to check on the level of progress being made toward the county’s stated goals for the year. Ohio Farm Bureau offers an achievement award program where counties show their program results. Counties compete against other counties of similar membership size to determine the best of the best. Awards criteria include member involvement, communications, planning and results. Some examples of what each action team works on are listed below. The Communications Team works to promote and educate the public and its members on the importance of agriculture. These activities include holding a farm city tour, providing lesson plans to teachers about agriculture, provide library display’s and send out correspondence to its members. They also provide a membership campaign to sign up and renew members each year. When a new member is signed up they are invited to a dinner with other new members to learn about what we are and how they can help. They also provide a building at the Stark County fair to help promote and educate the public about the organization and agriculture. The Public Policy Team works to educate the legislators on the importance that agriculture plays in their district. We try to create a working relationship with all levels of government so our member’s voice can be heard. They also head up our policy development process. Each farmer member is asked to submit a policy suggestion that the county, state and national Farm Bureaus should consider. Those suggestions are voted on at our annual meeting in September. The membership votes on all the suggestions and if they pass they become the county, state and national Farm Bureau policy. This activity is grassroots at its finest. They also hold informational meetings when a topic needs to be explained to many people. We have held meeting on CAUV, oil and gas leasing and much more. The Organization Team provides a committee of volunteers that help keep the county Farm Bureau running smoothly. They help provide a budget for the board of trustees to consider, a financial committee to make suggestions on investments and provide an audit of the finances. They also plan and implement the annual meeting of the members, promotions to encourage our partner Nationwide to sign up members, a safety meeting for those involved in our workers compensation group rating program and hold family oriented events for Stark County. The Center for Food and Animal Issues Action Team is a brand new committee. They are working to build a relationship with local animal groups. They monitor any zoning or rule making that involves agriculture. They want to make sure those rules don’t negatively affect the farmer to the point that it puts them out of business. They work with the Communication Action Team to help educate consumers about the importance of livestock agriculture. There are many factions that are trying to do away with livestock agriculture and the committee helps to educate on how important animals are in our daily lives. They work with local schools on Earth Day events and help to provide training for our humane officers on livestock agriculture. We would love to have you as a part of our volunteer teams! Agricultural & Farm Web sites by The Web Factors.